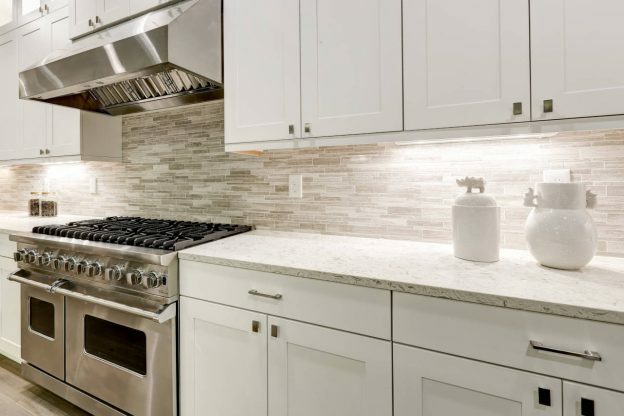 How Much Does a Kitchen Backsplash Cost in 2019? A kitchen backsplash can come in many different styles, colors, and patterns. Tile is not your only option. Your backsplash could be an opportunity to make a personal statement during your kitchen remodel or new build. When it comes to a backsplash, you have a blank canvas you can fill with traditional tile patterns and the popular white and gray marble or mosaic tile. Or, you could go off-book and come up with your own design. For DIY projects by novice installers, adhesive tile mats are also available to simplify the project. Although these are more expensive than traditional thinset, they are popular for DIY projects because there’s no mixing and only a small mess of backing and paper to clean up after the install is complete. Before any pricing can be estimated, you’ll need to find the square footage you will cover with backsplash. You can use our quick square footage calculator, or just multiply the height and width of the area in feet. Our tile calculator is also an excellent resource for estimating backsplash material if you’re going to use tile. Typically, ceramic tiles cost $25 per square foot to install; stone about $30; stainless steel or other metal about $36; and glass about $32 per square foot. How much your install will cost varies substantially, depending on the complexity of the install, as well as workarounds like electrical outlets, fixtures, and finishes. Variables to traditional prices might include, patterns that require multiple cuts and those that are difficult to reach. In addition, complex patterns might require more wasted material. For instance, selecting a pattern that places tile at an angle, such as the herringbone pattern, will require about 20% additional material to account for off-cuts, which can represent a significant increase in price. Labor rates also vary significantly throughout the nation, and if you’re hiring out the job, then this will be a significant variable in the price. Of course, the cost of material will also be a considerable cost factor. Read on to learn more about various material costs. Ceramic comes in basically three grades, ceramic, mid-range ceramic, and terracotta ceramic. Plain ceramic is about $2.00, mid-range $3-4.00, and terracotta ceramic is $5.00 per square foot. Porcelain is $3-6.00 per square foot. Stainless is about $20 per sq ft, and there are other metals and metal sheets that can get used as a backsplash for $20 to $25 per sq ft.
High-grade marble is $7-10.00 per square foot. The price and quality of glass varies significantly between $10 and $30 per square foot. Slate costs about $5.00 per square foot. As mentioned above, these are an excellent product for the DIY backsplash. However, you could pay as much as four times what you would pay for thinset. However, for the DIY project, what you pay for is convenience. You will not have to wait for the standard 24-72 hours to grout. Adhesive mats cost roughly $2.00 per square foot in addition to the price of the selected tile. Another convenient alternative to tile is the laminate sheet or slab backsplash. Sheet backsplash is the generic term given any large sheet of protective material used in the kitchen or bathroom as backsplash. These sheets are mostly a single color, though a popular choice is the faux veined or striated marble. These are easy to clean, and no seam sealer is necessary. Installing these sheets cost about $45 or $50 per square foot. However, as a DIY project, you can do these for about $5.00 per square foot. Some sample prices are: stainless steel at $80 per square foot; beadboard at $1.00 per square foot; granite at about $45 per square foot; vinyl wallpaper (not recommended for around the stove) at $1.00 per square foot, but there are other choices, so consult with installers in your area. To avoid confusing quotes, tell the contractor what you want and how you want the price broken down. For instance, tell the contractor you wish to get 20 square feet of herringbone subway pattern ceramic tile installed, and you want a price per square foot. We suggest getting at least three estimates from qualified tiling contractors. You might also be interested in our cost guide for new kitchen countertops.